Yesterday we arrived at the Atacama region of Chile, and are staying in the small town of San Pedro. 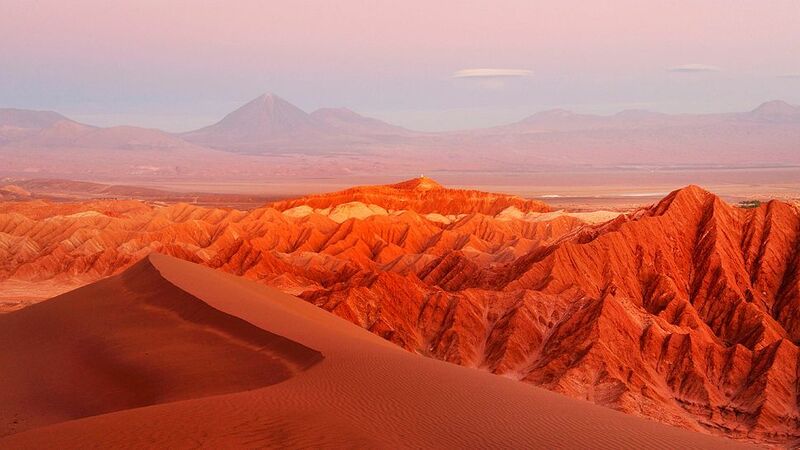 Atacama is perhaps the driest region in the world, and San Pedro is at an elevation of about 8,000 feet. That combination can be quite a punch. Fortunately we’ve been at a similar elevation the past couple of days at CTIO, so that isn’t too bad. The arid air, however, is a different story. Hydration is key at this point. While Cerro Tololo had an almost overwhelming beauty to it, Atacama is a bit different. Magnificent desolation, to paraphrase Buzz Aldrin. But the arid and high conditions of the region are exactly why ALMA is here. But that’s a story for tomorrow. For now it’s time to have a bit more water, and get some sleep. This reminds me of one of the things that bothered me about the original Star Trek series: the planet’s were always one-trick-ponies. They’d arrive at one location and immediately decide that the planet was deserted, and the terrain was uninhabitable. Obviously that _shouldnt_ be the norm – at least for planets we’d be interested in visiting. Atacama vs the Amazon, just separated by a slim spine of steep mountains. Why couldn’t they invent a planet like that?